DIY Expert Advice Print this Project! "This job was about as simple as it gets." Today I’m walking you through a project I recently completed with my friend Tim. He wanted to replace his existing surface with a new, low-maintenance composite deck surface. 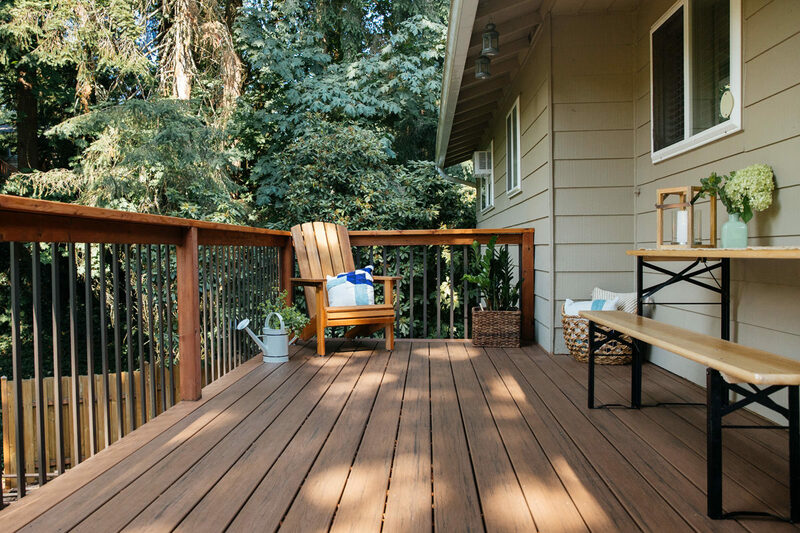 The job was about as simple as it gets (and you shouldn’t run into any snags, either), but before you run down the road of resurfacing a deck with composite decking, this blog should serve as a helpful tool by spelling out what to watch for and what alterations you might need to make. Let's get started. We started by clearing the deck furnishings and temporarily removing the deck railing balusters to give us more room to work. Then, we pried up the boards (a surprisingly easy task with pry bars), which had been nailed down when the deck was originally built. 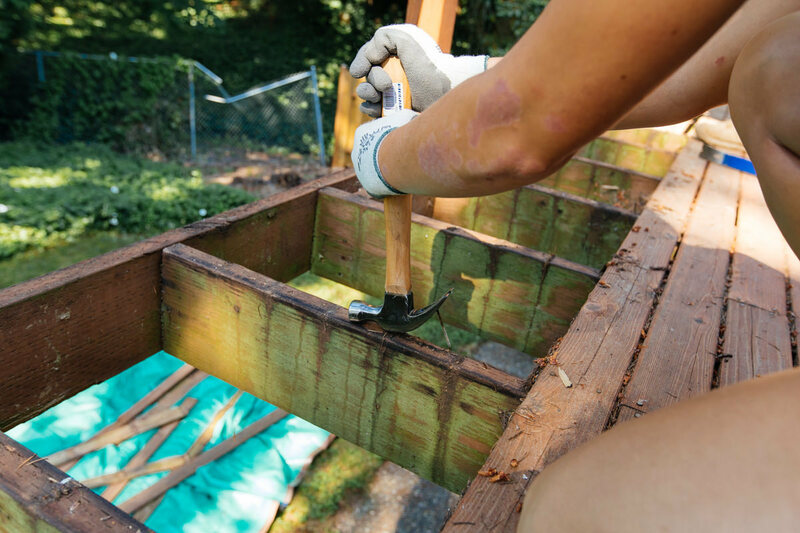 Often, the nails came right out with the board, but other times, we had to remove the nails from the deck joists after the board was gone. Once some of the boards were removed, we built a movable platform to walk on during the resurfacing project. 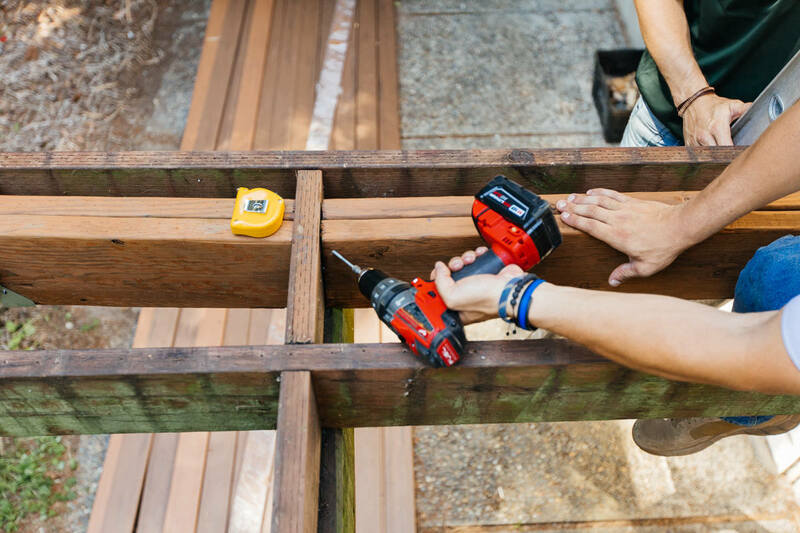 With the deck boards completely removed, inspect the subframe of the deck and check for loose or incorrectly installed framing, then correct as necessary. Thankfully, our subframe was in great shape. We installed a “picture frame” on three sides of our deck, which requires a bit of extra framing to support some of the perimeter deck boards we’ll install later. 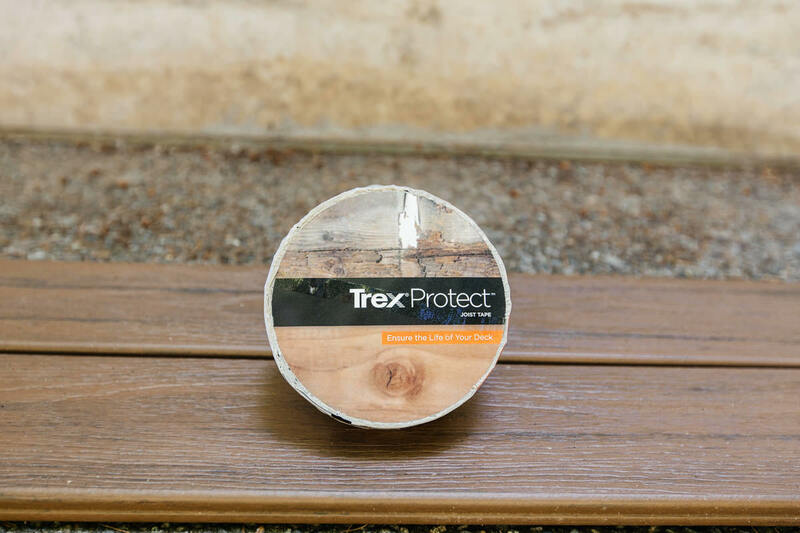 Most treated lumber in our neck of the woods requires a liquid wood preservative to be applied to cut ends, so have some of that on hand as you’re installing. 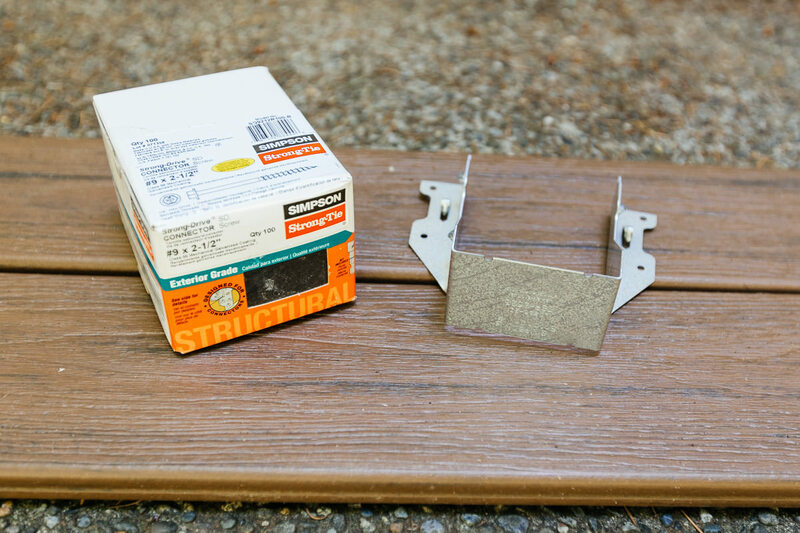 A best practice for resurfacing a deck is to adhere a rubber-type tape to the tops of the existing joists. 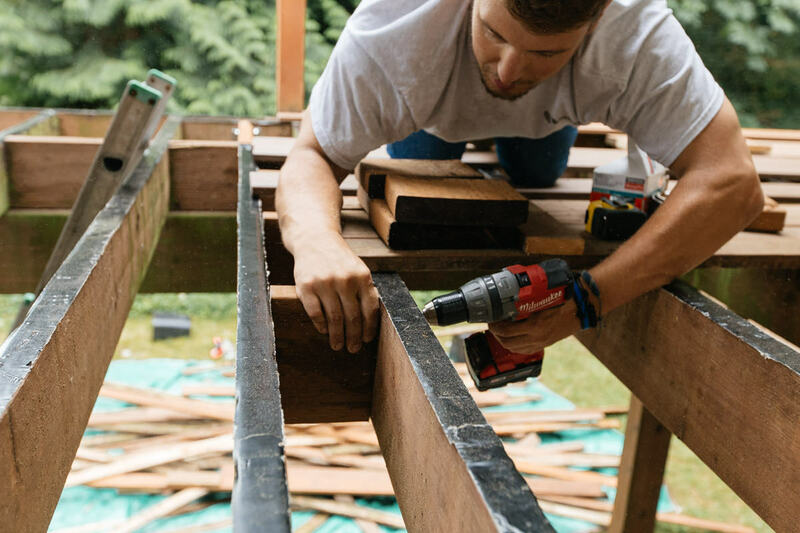 This will cover the holes left by the old nails and provide a protective surface for the top of the joist where water can collect and cause problems down the line. The tape will also close up around the new deck board fasteners you’ll use later on. Manufactured decking often requires a fresh cut on the boards, so we trimmed a bit off the factory end of each deck board and then measured and cut the specific length we needed. Before we get started with the deck resurfacing, a few quick notes about fastening deck boards with deck screws. The homeowner chose manufactured decking from the TimberTech PRO Tropical Collection for their deck surface. For the best results, we used the Smart-Bit Pre-drilling and Countersinking Tool, which drills a hole to a desired depth every time (in our case, the thickness of the deck board), and the Smart-Bit Depth Setter, which drives the deck screw to the perfect depth so that it's even with the top of the deck board. We fastened the deck boards down using the “face screw” method, which is simple and easy. 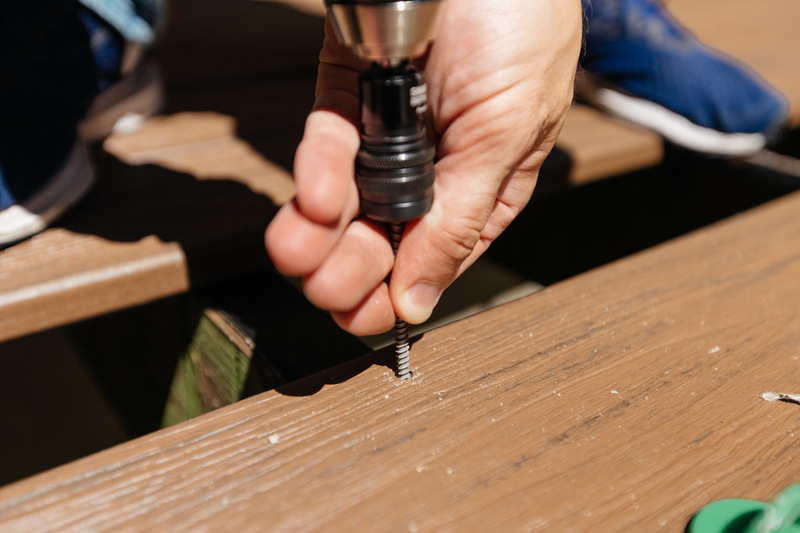 Exterior-rated screws are a must—we chose Screw Products C-Deck Star Drive Composite Deck Screws, which are specifically designed for composite decking materials. 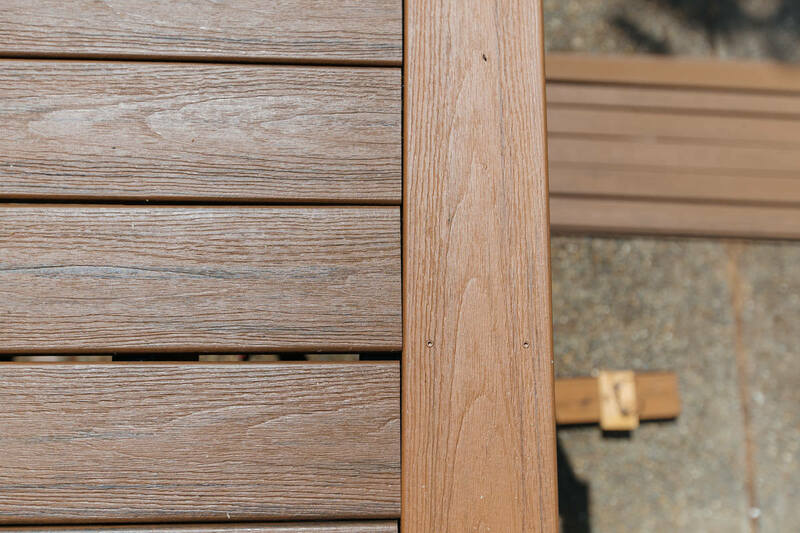 The screws are available in nearly 25 colors, so the heads will blend into virtually any brand and color of decking. Now that you have this information, screw down your deck boards. We worked from the outside of the deck toward the house, so the picture-frame perimeter boards came first. Our deck had some existing railing posts to work around, so we measured carefully and then notched out the deck boards where necessary with a jigsaw. Once the perimeter boards were cut, we fastened them into place. It’s important to leave a gap between all decking boards so rainwater can drain and debris can fall through the cracks. This deck has some large fir trees nearby, so our gap needed to be big enough to allow smaller particles to fall through. If you’re working with manufactured decking, figure your gap based on outside temperature—it expands and contracts significantly in the sun. Consult the installation instructions and note that the gap between deck boards will likely be different for side-to-side and end-to-end. To keep gaps accurate and consistent, we used plastic spacers. Our deck has a breaker board about a third of the way down. From here, boards run out to the perimeter boards we’ve already installed. Figuring in the gap at both ends, we measured the exact length of the boards needed, cut them to length, and then fastened them down, working from the outside railing toward the house. 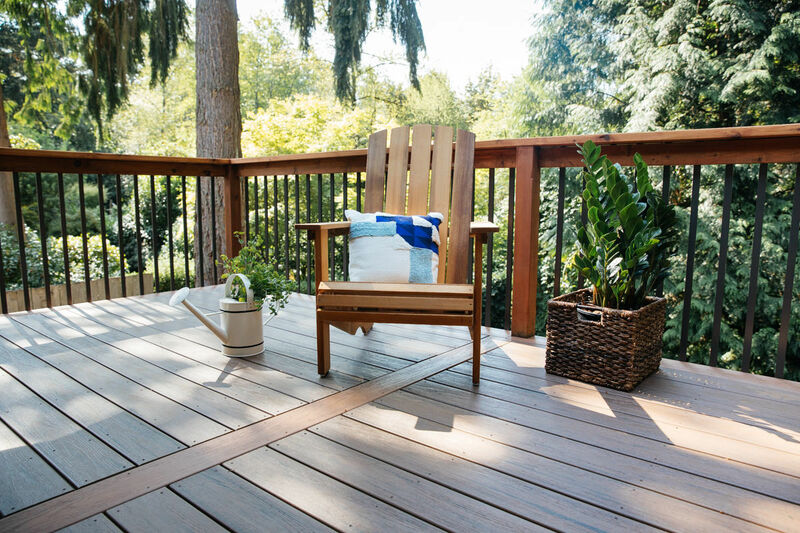 Note: If you’re using this TimberTech decking, look for the small marks on one side of each board—keep it consistently on the same side (e.g., the house side), and you’ll have a more pleasing grain pattern to the boards. 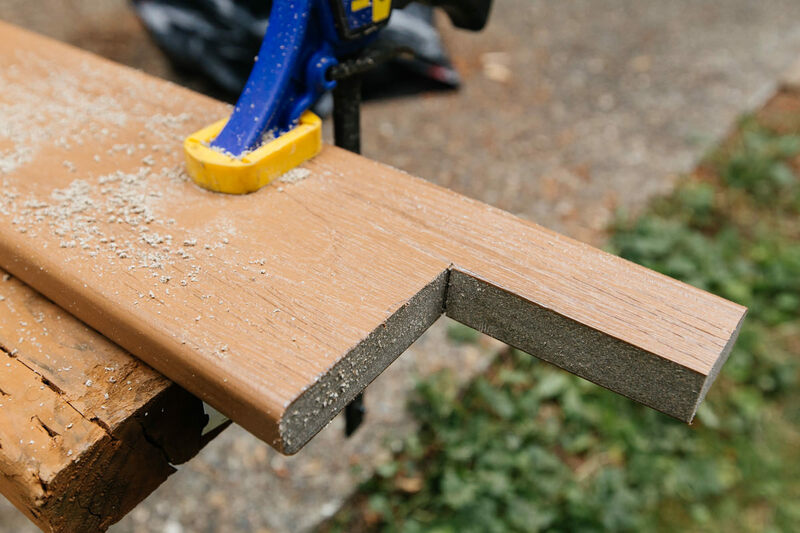 Your last board likely won’t fit perfectly—with a circular saw, we carefully cut ours lengthwise after rigging up a straightedge. That’s it! Reinstall the railing balusters, put back the furniture, and enjoy your new outdoor living space. 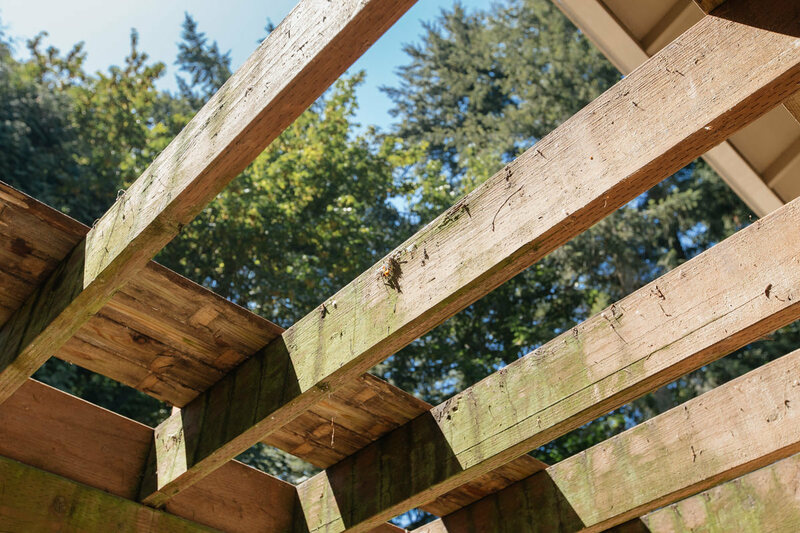 Visit our deck safety checklist to ensure your entire deck remains in good shape. This white wood and copper pipe shoe storage rack pulls double duty as an entryway shoe storage solution and bench.